If you're going to make a true-life dramatic recreation of a piece of space exploration history, wouldn't it make some sense to ask yourself, "How am I going to create a film that is at least as good as Philip Kaufman's The Right Stuff?" The classic 1983 epic about the early days of space travel, based on Tom Wolfe's bestseller of the same name, focused on test pilot Chuck Yeager (Sam Shepard) and the astronauts who comprised the Project Mercury team (including stars Ed Harris, Dennis Quaid, Scott Glenn, Fred Ward and Lance Henriksen) and led the world into space travel. Kaufman's film is a dazzler - groundbreaking special effects, brilliant satire, thrilling personal/professional drama, swirling romanticism and, much like Kubrick's 2001: A Space Odyssey, is one of the few films that actually gives us a sense of what space travel must really be like. There's nothing quite like it. 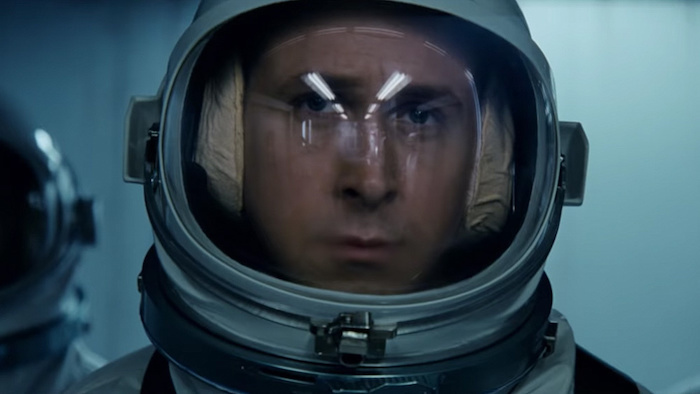 First Man by Damien Chazelle (Whiplash) focuses upon Neil Armstrong (Ryan Gosling), the first human being to actually set foot on the moon in 1969. Written by the normally talented screenwriter John Singer (Spotlight) and based on the James R. Hansen book First Man: The Life of Neil A. Armstrong, this is a screenplay that plods along with cliches - focusing, almost by-rote on TV-movie-like family drama, de rigueur preparation and training and the eventual journey and moon landing. The whole movie feels like a been-there-done-that affair. It doesn't help that we have to stare at the supremely overrated, dewy-eyed, annoyingly soulful and humourless hunk Ryan Gosling. Even worse are the endless jittery closeups used to replicate the actual space travel. Yes, I'm sure the litany of technical/science experts provided insight for Chazelle to create this mise en scene, but given the cinematic brilliance employed by Kaufman in his film (never mind Kubrick), this cliched shaky-cam approach is all sizzle, but no steak. The movie feels dead. Even the sequences involving Armstrong's first steps upon the moon surface have a kind of blah "quality" to them. There's no oomph or dramatic/emotional resonance to any of it. It was hard slogging through this movie with memories of The Right Stuff dancing through my head. Not that I wanted the usually original Chazelle to approach the material in any sort of derivative fashion, but again, I reiterate: the bar for space travel movies was set so high by Kaufman that it flummoxes me that Chazelle chose such a dull approach to the material. When I think of the verve and excitement he demonstrated with the astonishing Whiplash, I expected so much more than something that feels so dull and familiar. And here's something I never thought I'd find myself saying, but why, oh why does the film place absolutely no emphasis upon the planting of the American Flag on the surface of the moon? Yes, the flag is there. We see it clearly as Armstrong goes through his routines on the lunar surface, but given the importance of this flight to both the government and people of the United States, how can we not get a glorious moment where the flag is planted? I'm sure this was an intentional omission on the part of Chazelle and his writer. God knows they wouldn't want to sully themselves with anything that might seem vaguely propagandistic. But you know what? This might have been one of many things to give this movie some life. Too much emphasis is placed on a kind of "documentary"-like approach. But damn! This is a movie! It should be BIGGER than life, not smaller than one of America's most astounding historical achievements. Looking for a consumer report on movies? Looking forward to polite and/or politically correct analysis of movies? Looking for humourless mainstream film criticism? Looking for impersonal, dispassionate commentary and analysis? Looking for someone who knows as much about cinema as you do? You might not always like what you read, but you'll have something to say about it. So, dear reader, let's engage in discourse. It won't always be the sort of discourse one experiences face-to-face, but the kind of old fashioned discourse that occurs twixt writers and readers. If you don't know what that refers to, GRAB A BRAIN, why don't you? Let's celebrate our mutual passion for the greatest artistic medium of modern civilization. Let's revel in our personal memories, histories and cultures behind the backdrop of the movies we see, love, hate, think about and, if need be, repress. Most of all, let's have some fun! GIRL MODEL - Review By Greg Klymkiw - The exploitation of Russian girls as young as age 13 in Japan is examined in a chilling portrait of shattered hopes and dreams within a modelling industry that values youth, beauty and the sexualization of pre-pubescence. Some Brief Thoughts On Atom Egoyan Upon Recent Reviews (especially Peter Bradshaw's in the Guardian) of His New Film THE CAPTIVE and an utterly moronic article in The Huffington Post that gave me the runs. Musings and Analysis on the Great Man Egoyan - By Greg Klymkiw, Esq. JAWS - Review By Julia Klymkiw (Cub Reporter) - For Universal's 100th Anniversary, a new Spielberg-approved restoration of his modern horror classic is playing theatrically and launching in Toronto at TIFF Bell Lightbox. 11-year-old Klymkiw Film Corner Cub Reporter Julia Klymkiw weighs in with her thoughts! Pigs Continue To Fly - Artwork by Waldemar von Kozak. Copyright © 2011 Greg Klymkiw . Theme images by johnwoodcock. Powered by Blogger.